Small towns are supposed to be idyllic and peaceful, but when Kate Chambers returns to her hometown of Wheeler, Texas, she soon learns it is not the comfortable place it was when she grew up. First there's Gram's sudden death, which leaves her suspicious, and then the death of her married sister's lover. 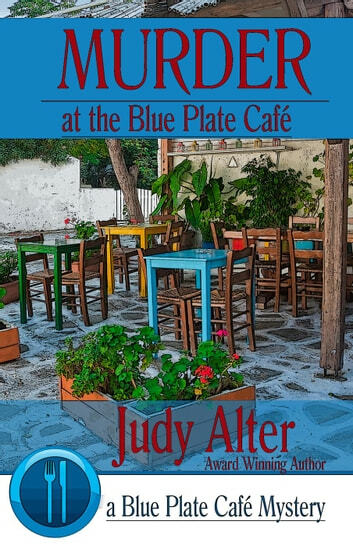 Kate runs Gram's restaurant, the Blue Plate Café, but she must defend her sister against a murder charge, solve the murders to keep her business open, and figure out where the café's profits are going. Even Kate begins to wonder about the twin sister she has a love-hate relationship with. Gram guides Kate through it all, though Kate's never quite sure she's hearing Gram—and sometimes Gram's guidance is really off the wall. Kate Chambers is coming back to hometown after her grandma's death and takes over the diner called "Blue Plate Café". Her grandma's death is so sudden that Kate wonders if it's a murder. However, the progress of this book is a little slow for my taste until another murder occurs and her twin sister is a suspected murderer, then Kate tries to solve a crime. The storyline was wonderful. A true page turner, every time I thought that I had figured out a certain character was wrong.